Help honor our hometown heroes. 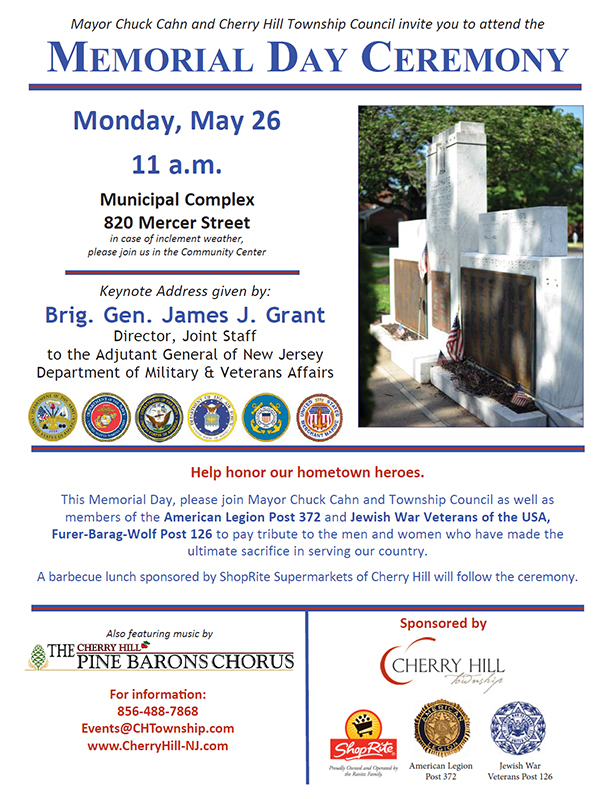 This Memorial Day, please join Mayor Chuck Cahn and Township Council as well as members of the American Legion Post 372 and Jewish War Veterans of the USA, Furer-Barag-Wolf Post 126 to pay tribute to the men and women who have made the ultimate sacrifice in serving our country. A barbecue lunch sponsored by ShopRite Supermarkets of Cherry Hill will follow the ceremony. Also featuring the music of The Cherry Hill Pine Barons Chorus. Sponsored by Cherry Hill Township, American Legion Post 372, Jewish War Veterans Post 126 and ShopRite Supermarkets of Cherry Hill. For information: 856-488-7868 or Events@CHTownship.com.